This non-reader actually enjoyed a nightly reading session in 2014. After being challenged by my daughter to read a Fault in Our Stars with her, followed by a viewing of the movie, I became hooked. I read seven books from July-December in 2014 and am looking forward to reading twelve books in 2015. I'm enjoying sharing my daughter's passion and carving out a different kind of "me time" after my workouts are complete. Running has relaxed me and is also helping me sleep better. 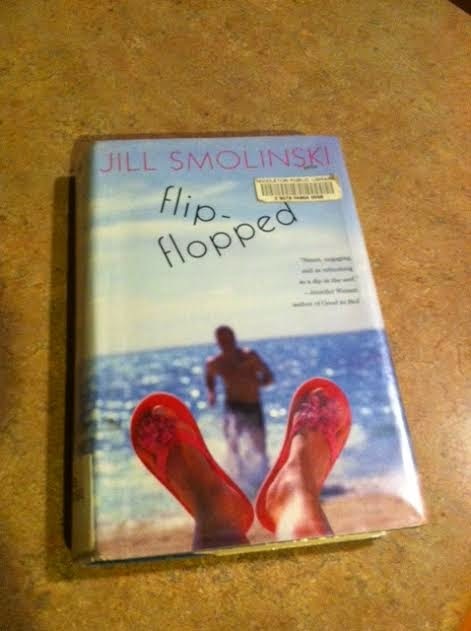 I accidentally discovered this book while the kids and I were at our local library last month. It was displayed in a selection of new books at the library. I saw it and immediately placed it in my library bag for my next read. This was an easy read and I really enjoyed every minute of it. the first part of the book describes Alexandra's experiences as a new runner to completing several marathons. The second part answers many questions you may have about running and the lifestyle of running that new runners may have, but are too afraid to ask. I identified with much of the book, as I didn't start running until my mid-20's and never thought that I could put one foot in front of the other to run around the block - let alone run marathons. The funny experiences Alexandra experienced - getting fit for real running shoes, finding the perfect sports bra, overcoming fatigue and crazy thoughts during a race were all enjoyable to read. In this book, she also touches on the support of loved ones and the misunderstanding of others as you follow your own journey through a healthy lifestyle such as running. 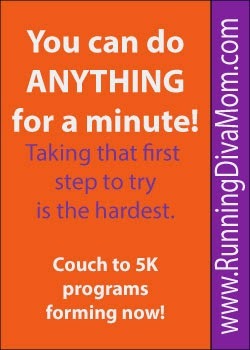 Every seasoned runner or new runner will enjoy this book and I highly recommend to all of my female couch to 5K clients. Do you have a favorite book that I should be added to my reading list for 2015? Here are a few motivational quotes for your weekend. Have a good run! Don't listen to the doubt. Let it go. Stepping outside of your comfort zone isn't easy. But, I promise you ... It's worth it. 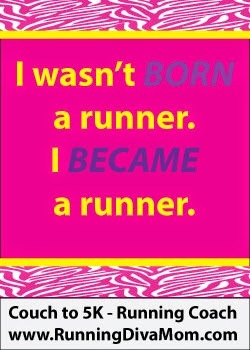 I wasn't BORN a runner. I BECAME a runner. You can do ANYTHING for a minute! Taking that first step to try is the hardest. 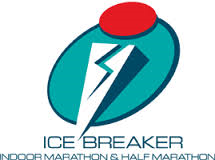 This past weekend I completed my first indoor marathon at Icebreaker Indoor Marathon in Milwaukee, Wisconsin. 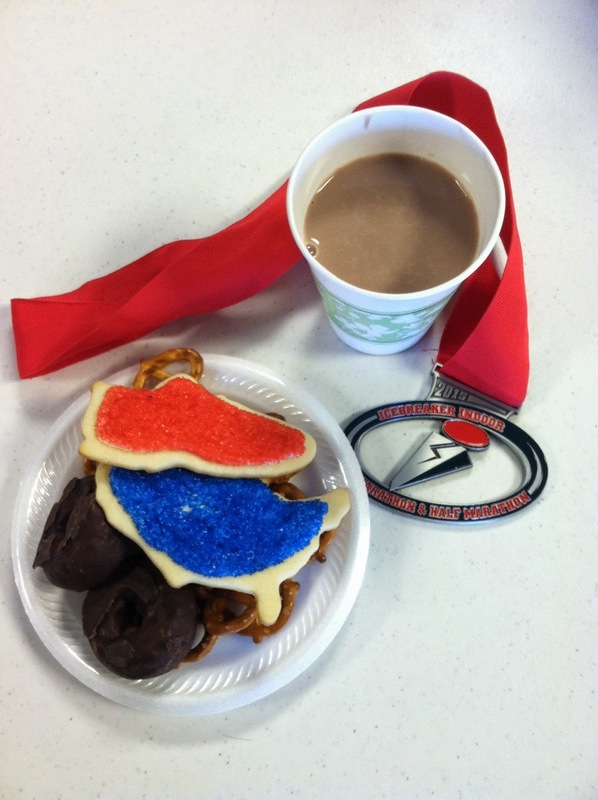 What is an indoor marathon exactly? It is run on an indoor track, around an ice arena. The full marathon was 95 laps total. I had previously completed the half marathon event two times. I thought that was an adventure, but the 26.2 miles was a whole other test of endurance and mental toughness. We carb-loaded the night before with a pizza casserole and went to bed early. The alarm went off at 4:55 and I climbed out of bed for some coffee, got dressed and did my hair and make-up (why, yes I did!). I have previously had tremendous trouble with chaffing and bleeding on my thighs, so I opted to wear capris under my running skirt. That ended up working really well for me. I did miss my compression socks, however. I ate some cinnamon toast, greek yogurt, and coffee. We headed out the door around 6:00 and drove to Milwaukee. After a potty stop, we arrived at the Pettit Ice Arena around 7:20, later than we had hoped. We checked in upstairs quick and said hi to our friends, Bill and Amy. I downed an energy shot, a banana and some Power Bar chews around 7:30 and used the bathroom about four times. I get nervous and think I need to use the bathroom WAY TOO MUCH before a race. I even tried to limit my fluids the morning of the race. It was going to be interesting seeing port-o-potties for 95 laps straight. We found a spot along the track to layer our bags, gear and nutrition. I lined up energy gels, gum and a bag of peeled oranges. We took our labeled water bottles over to the water table. This station was being managed by volunteers. You would call out your bib number and on your next lap they would have it waiting for you. Labeled by "water" or "sports drink" they will also refill your bottle for you. Very handy. I had forgotten my Garmin watch charging on the desk at home, but was able to locate to spare stopwatches in my duffle bag. I wasn't going to be using the GPS indoors, so it worked out just fine. I ran a 4:04 at Madison Marathon in early-November and hadn't trained much over the holidays. Hubby hadn't either, as he had been struggling with tendinitis in his foot. I got in my own half marathon the day after Christmas and ran about sixteen miles during a training running at the ice arena two weeks before the race. Otherwise, my mileage was pretty low. 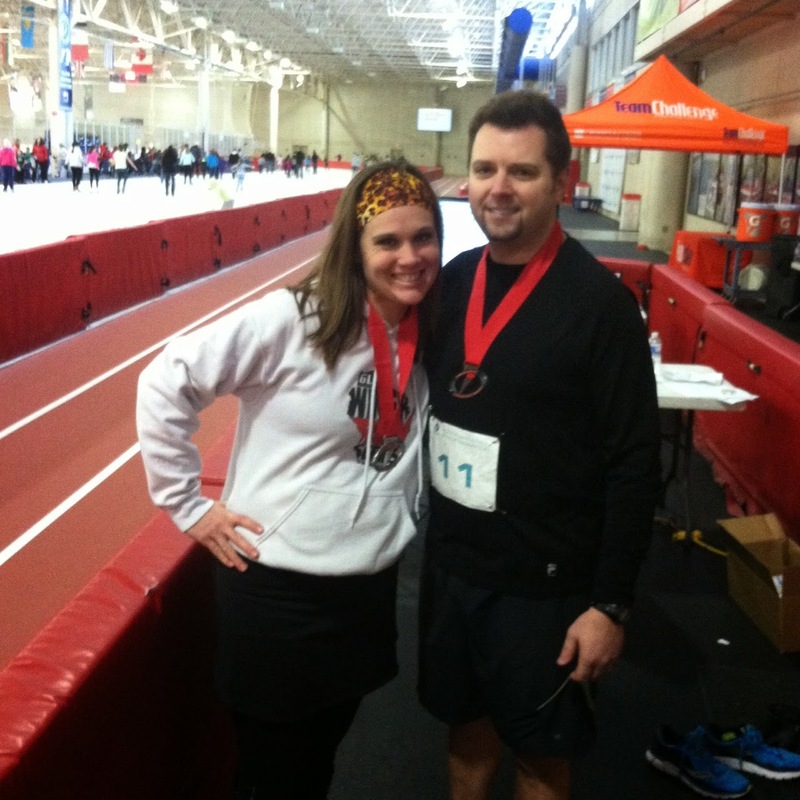 The goal of the indoor marathon was just to use it to "stay fit" and we had a "just finish" attitude. About 100 runners lined up on the track and we were off shortly after 8:00 AM. Hubby and I were together for a few laps, and then I went ahead. Eventually he passed me with good cheer at some point and then I passed him again. I continued to be laps ahead of him. Every fourty minutes or so I would quickly run off the track and grab an energy gel and a stick of gum. I would sip on my gel for about three miles, toss it, grab water or sports drink, and then chew gum for a couple of miles. Then, I'd repeat the process. I finally got in a rhythm around the one hour mark. I could quickly tell that just as I had guessed, that most of these runners were seasoned - and faster than me. I mean, how many people are going to run an indoor marathon as their first event? Hockey was being played center rink. Later, families were ice skating in the middle of the track. I passed the half way mark around 2:07 which was extremely slow for me (I'm usually 1:56-1:58), but was so out of shape and had put on some pounds over the holidays. So, it didn't surprise me. Around 2:45, I felt something pop on the side of my right foot. I have the same blisters on the sides of my feet that cause me problems, callus and then pop again. I had used blister bandaids, but the bandaid either slipped or the blister popped through. Not more than ten strides later, I felt a twinge on the middle toe of my left foot. I had a feeling my toenail was starting to come off, from a Madison Marathon injury. I adjusted my footwork for the next mile and eventually forgot about it. After the race, my socks were bloody. I consistently took water and sports drink and my urge to use the bathroom finally left my mind around three hours. At three hours, I grabbed my bag of oranges and ate the slices while I ran. They were what I needed. I always crave oranges when I run long, but never have them on hand. The accessibility was perfect! Headphones were not allowed. I kind of struggled not having access to my own tunes and my power songs when the mood struck. But the music was decent. Everyone was able to request a song at registration and songs were made into the marathon playlist. I was hearing about the winners finishing and the leaders were being announced and how many laps they had left. I had many laps ahead of me. It was weird thinking about having "30 laps left" - how many miles did that equate to? It was between 3.5-4 laps per mile. So I kept myself entertained, doing calculations in my head. It was different, not to pass those standard "half way" or "twenty mile / the wall" mile markers along the course. There was a leader board, that showed how many laps you had left. There was also another board next to the announcer's table, that coincided with the timing chip mat. You wore a timing chip around your ankle. It counted your laps. I liked that it told me how many laps I had completed and my pace for each lap. My laps averaged 2:44-2:49 for much of the race. For the last hour, they were approximately 2:50-3:01. When I heard that I had five laps left, I got a burst of energy. I took my last swig of water and was OFF! I picked up my pace and started using more of the inside lane to pass people. Finally, I heard that I was on my last lap - and I took that victory lap. I was breathing heavy as I came off of the track to receive my medal. It was kind of strange to be done and have no finish line. But, I had accomplished 26.2 miles for the past 4.5 hours - even more miles, because I ran on the outside of the track for 99% of it. I finished in 4:26:43 ... and oh yeah, I never used the restroom. 22 minutes slower than Madison marathon 2.5 months ago. This was one of my slower marathons, but the only one I haven't officially trained for. So, I call it a WIN! I collected myself and walked a a few minutes and saw that hubby had 15 laps to go. I cheered him and other runners on for a few lips and then walked to the restroom and put on a heavy sweatshirt, as I was starting to feel the cold temperatures of the ice rink, and my teeth were chatting. When I came back out to the rink, I was doing the "marathon shuffle" and hubby had less than ten laps to go. He was walking and I asked if I could join him. I wanted to root him on, and could use the "cool down" and needed to warm myself back up. I grabbed a water bottle and we ran/walked the next 8 laps together, bringing me over 100 laps for the day. My hubby finished in 5:29 and some change. I was very proud of how much he overcame obstacles he's been struggling with and moved his body for more than 26 miles without much training. We both said we have another "training run" under our belts. We grabbed snacks upstairs (tasty cutout cookies, chocolate milk, donuts, pretzels, subs and more treats that were left) and drove home for some pizza and couch time together at home. Many of you may have set a new year’s resolution to drink more water or give up soda. I gave up soda in November and am nearly three months of being soda-free. Being a Diet Mountain Dew addict, I admit that it was difficult at first. I especially struggled when eating out, but it’s totally been worth it. Water keeps you hydrated, makes you feel less bloated and you consume less calories. Water also makes your skin clearer and more hydrated, which is especially important this time of year. Choosing water when dining out is also a money saver. I have been playing a lot of tricks with myself to consumer more water. Here are fifteen ways to consume more water throughout your day. 1. Start your day off right. Drink a large class of water first thing in the morning after you brush your teeth. This works well when taking your daily vitamins and prescriptions. 2. Refrigerate a day’s supply of water the night before. Ice cold water is much more refreshing to drink. 3. Keep ice on hand. 4. Keep a to-go cup with you at all times while running errands. This is especially helpful when grocery shopping while hungry! 5. Store a supply of pretty tumblers at home and at work. You will be more inclined to reach for something that makes you happy. 6. Drink a glass of water after your last cup of coffee. This will also help keep your teeth clean. 7. Keep fresh lemons and fruit on hand to sweeten up your water. 8. Drink with a straw and consume more throughout the day. 9. Drink water with your meals instead of soda, juice or milk. 10. Take a water bottle with you while you exercise. Invest in a handheld water bottle for mobility. 11. Invest in a large jug of water and fill it in the morning. Mark the jug with a half way goal and try to reach it by Noon. 12. When going out, alternate each alcoholic beverage with a glass of ice water. This will help keep you in check and you will consume less calories, too. 13. After you complete each project during the day, enjoy a glass of water. You will consume more water and feel accomplished in more ways than one! 14. Use sugar-free flavor packets to sweeten up your cup. 15. Drink a glass of water before each meal. This will also prevent you from eating more. Winter is here. Which means cold, snowy runs for many runners. And for many of us it also means dark runs outdoors - before or after work. Sidewalks aren't necessarily shoveled and roads aren't always clear. Dark skies can make for deceiving conditions. Even if you think the ground is safe or clear, there may be hidden patches of ice. Yaktrax (HERE) makes running outdoors during the long, winter months easier. Yaktrax are available in several different styles and sizes. I was sent the Yaktrax RUN in a size Small (for US Women's Sizes 6.5-10). They fit perfectly over my size 10 Saucony Mirages. The Yaktrax RUN is the only traction device anatomically designed to meet the needs of runners braving the winter elements. Run naturally on packed snow and ice with the Yaktrax Run's combination of removable spikes and steel coils, providing 360° of unbeatable traction. Continue your training during the winter with the same stability you are accustomed to on dry surfaces. The Yaktrax Run can be worn in temperatures as low as ‑41° Fahrenheit. You may pull these out of the package and think "How the heck do I put these on my running shoes?". However, each park of Yaktrax comes with really helpful directions inside. And each pair is market with "toe" and "heel" for easy assembly. Unlike other generic versions I've used in the past, Yaktrax RUN also come with a handy strap to place over the top of your foot. This helps keep your Yaktrax in place and I found it very helpful - and comfortable, too! When wearing them for the first time, they may feel a little awkward. You can feel the coils underneath your foot. They don't fit and don't rub and aren't annoying. They just cause you to change your stride a bit at first. 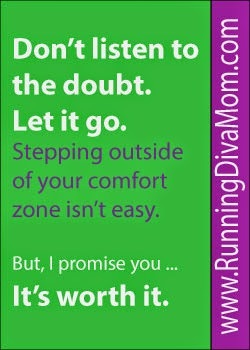 Once you get into your groove (just like any run), you will find your stride and be comfortable running in them. They are perfect for small amounts of snow and ice. I do find them pretty annoying to run on patches of clear sidewalk or road. After falling a few times on hidden ice over the years, and hitting my head or landing on my back, I wish I would have always worn these for cold, snowy runs. When the temperatures are at or below freezing, you never know what could happen. I find that Yaktrax really help me gain traction. I tend to keep my Yaktrax on an old pair of running shoes and keep my newest pair(s) of running shoes designated to indoor running during the winter months. It's easier than taking the Yaktrax on and off. And you aren't ruining your new pair of kicks. 5 – Post about this giveaway on your blog, Facebook or Twitter (@RunningDivaMom #RunningDivaMom @Yaktrax) account. LEAVE ME A COMMENT FOR EACH. Enter now though January 31. Classes start with one minute intervals of running/walking for 20 minutes. After nine weeks, participants are running a 5K (3.1 mi) in 30-45 mins. Ready to get back into running and get back outside? This outdoor running group will meet at Orfan Park each Thursday evening in March at 6:00-6:45 PM - March 5, 12, 19, 26. Cost is $35 for all four weeks. Please wear reflective gear and bring a headlamp/flashlight to the first class. Daylight savings begins March 8. After the last class, we will meet for a post-run dinner/drinks at Monk's in Sun Prairie (optional). I may not look like a runner. 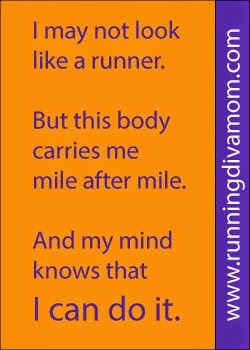 But this body carries me mile after mile. And my mind knows that I can do it. 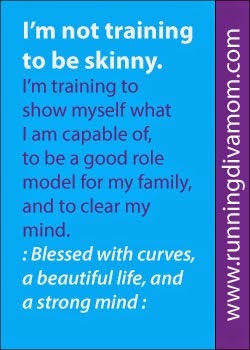 I'm not training to be skinny. and to clear my mind. Blessed with curves, a beautiful life, and a strong mind. This book hit close to home. It's amazing how we don't realize what our mothers do for us and how they shape us, until we have children of our own and are shaping the lives of others. This book follows Kelly's journey, as she travels the world and realizes what she already had back home. Her opinions, reactions and knowledge change further once she has two daughters of her own and confronts that various stages of life. Do you have a favorite book that should be added to my reading list? What book is your nose currently in? D Belt is a fashion fitness solution - especially for runners. We carry so many things with us. I know that I have so many necessary running essentials, that it can be difficult to keep track of it all. And storing it is a whole other dilemma. D Belts are designed to make you be fit, be free and be fashionable. I have tried many waist belts over the past decade and really enjoyed this one, because it had a velcro closure. It made it easier to put on and was more adjustable than others I tried. I tried the Medium/Large and typically wear a size 8 dress pant or size medium to large running skirt. These belts are incredibly available in five different sizes. I don't typically like anything around my midsection, but this was okay for a run of an hour or less in duration. I don't know if I would personally wear it for a extremely long run, because I just don't like that extra weight around my stomach. If you are familiar with hydration packs and other waist belts, I think you would enjoy this and all of the compartments. I didn't find that it moved or shifted too much. I was able to store my ID and some energy gels in one pocket as well as my car key, when I ran from a park. It would hold more, but I didn't want to add extra bulk and weight. These retail for just under $40 and would make a great USABLE gift for your Valentine. Stuff it with a few energy gels or chews and skip the chocolate and flowers this year! I just wish they offered more colors. But, the black does mix and match with every running outfit in your designated drawer or running gear! 5 – Post about this giveaway on your blog, Facebook or Twitter (@RunningDivaMom @TheDBelt #RunningDivaMom) account. LEAVE ME A COMMENT FOR EACH. Enter now though January 15. As I was running my six miles on the treadmill last night, I was surrounded by other runners and walkers at the gym. Every treadmill was taken. The place was filled with people sweating and trying to get a fresh-start after the New Year. People have set new goals and resolutions. 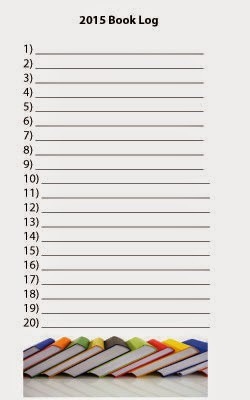 I workout all year long, but still like to have an blank page to start a new chapter every 365 days. I am a very goal-oriented person. However this year, many of the items placed on my attainable list aren't running-related. What goals have you set for yourself in 2015? ?